This site is NOT affiliated with the Nebraska Department of Roads. If you need official road information, Nebraska travel maps, construction updates, or current weather-related road conditions, click on the links provided. Additionally, if you're searching for Nebraska travel and tourism information, click here. 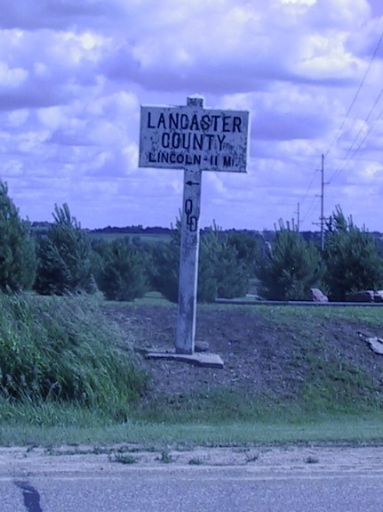 Concrete Lancaster county line marker erected in the 1920s to designate the O-L-D (Omaha-Lincoln-Denver) Highway. In the 80 years since, this road has also been the D-L-D (Detroit-Lincoln-Denver) Highway; US 38; and since 1931, US 6. This site is your one-stop source for unoffical information about the past, present and future of Nebraska's highways and byways. Interstate Highways: Nebraska's Interstate system extends for about 480 miles throughout Nebraska. US Highways: The original national route system, the US shield has been around since 1926. State Link/Spur Routes: Nebraska's other highway system. While Nebraska has neither a secondary highway system nor a county road numbering/signing system, it does have links, spurs and the elusive recreation roads. Learn more about the method behind the madness here. Nebraska Termini: Endpoints for Nebraska Interstate, US, state, and link/spur highways. Nebraska Trips: Ah, the roadtrip. I've been to almost every corner of Nebraska, and you're invited along for the ride. Nebraska Photos: I've taken many pictures of Nebraska during my life, and you can find them here. What's New: Check here for the latest news, updates, and corrections on this site. Acknowledgments and Links: This site would not as possible (or as informative, at the very least) without the contributions of the people listed here. Also, links to other sites that are related to this one some way or another. Legend: Conventions and terminology used on this site.